An outraged Sen. John McCain, R-Ariz., slammed the "systemic" problems plaguing Veterans Affairs health care centers around the country on Saturday, saying the Obama administration has "failed" to respond to the mismanagement and delays that have been linked to dozens of deaths nationwide. "Decent care for our veterans is among the most solemn obligations a nation incurs, and we will be judged by God and history by how well we discharge ours," McCain said in the weekly Republican address. "That's why I'm so deeply troubled by the recent allegations of gross mismanagement, fraud and neglect at a growing number of Veterans Administration medical centers across the country." "It's been more than a month since allegations that some 40 veterans died while waiting for care at the Phoenix VA were first made public," he said. "To date, the Obama Administration has failed to respond in an effective manner. This has created in our veterans' community a crisis of confidence toward the VA - the very agency that was established to care for them." The Phoenix facility reportedly worked to disguise patients' long wait times by creating a secret waiting list and later destroying the evidence. Reports suggest the same practice of using secret waiting lists may be happening elsewhere across the country. McCain, a veteran himself, recalled a town hall in Arizona last week where he was confronted by families whose loved ones passed away "because they were not provided the care they needed and deserve." "No one should be treated this way in a country as great as ours," he said. "But treating those to whom we owe the most so callously - so ungratefully - is unconscionable, and we should all be ashamed." Secretary of Veterans Affairs Eric Shinseki told a Senate committee this week that the problems with VA health care make him "mad as hell," and he said he's committed to "taking all actions necessary" to address the situation. The secretary said he's ordered a top-to-bottom audit of all VA clinics that could potentially conclude in as few as three weeks. 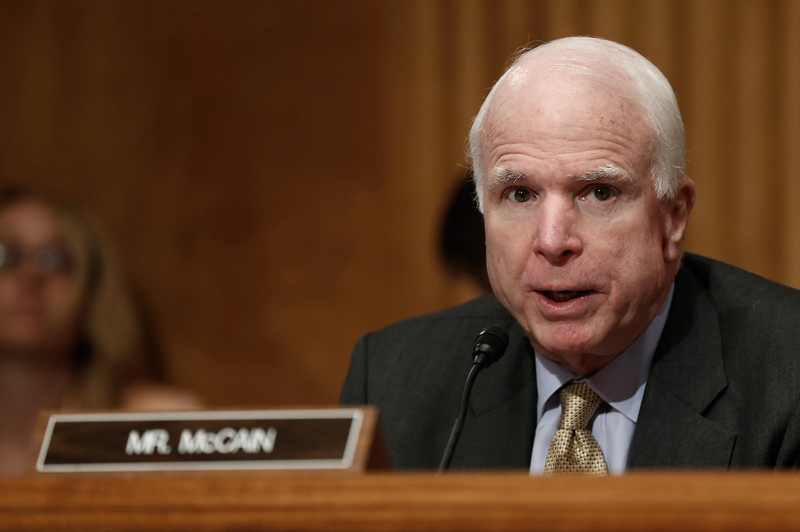 But veterans in need of care, McCain said, cannot wait for the administration to act. "They need answers, accountability and leadership from this administration and Congress now," he said. "Clearly, the VA is suffering from a systemic, cultural problem that Congress cannot resolve with piecemeal response," he said. "What's needed is a total refocusing of the VA on its core mission of serving veterans -- stretching from its top political leadership all the way through to its career civil servants." "Congress must also give VA administrators greater ability to hire and fire those charged with caring for our veterans," he added. "Most importantly, we must give veterans greater flexibility in how they get quality care in a timely manner." The VA health care scandal has been gathering steam in recent weeks as more reports of misconduct trickle in from care centers across the country. The Military Times, a newspaper that caters to the armed forces but is not published by the military or the government, called Friday for Shinseki's resignation. And among public officials, it's not just Republicans who are criticizing the administration. "We have more than allegations at this point, we have evidence, solid evidence, of wrongdoing within the VA system," Sen. Richard Blumenthal, D-Conn., said at Thursday's hearing. "It 's more than an isolated incident -- it's a pattern, apparently, of manipulating lists, gaming the system... which is not just an impropriety or misconduct, it is potentially a criminal act." On Friday, Robert Petzel, a top official with the Department of Veterans Affairs, submitted his resignation, and in an interview with CBS News Chief White House Correspondent Major Garrett, White House chief of staff Denis McDonough said Petzel's exit was not voluntary. "There is no question that this is a termination of his job there before he was planning to go," McDonough said in the interview, which is scheduled to air in full on Sunday's episode of "Face the Nation." "We're looking at accountability. We want to continue...to provide our veterans the services that they have earned." In President Obama's own weekly address on Saturday, he returned to his focus on executive action, touting recent administrative moves to bring jobs to America from overseas, generate more tourism revenue, and increase investments in infrastructure. "If Congress doesn't act by the end of this summer, federal funding for transportation projects will run out," the president warned. "States might have to put some of their projects on hold. In fact, some already are, because they're worried Congress won't clear up its own gridlock. And if Congress fails to act, nearly 700,000 jobs would be at risk over the next year." "That's why I put forward a plan to rebuild our transportation infrastructure in a more responsible way," he added. "It would support millions of jobs across the country. And we'd pay for it without adding to the deficit by closing wasteful tax loopholes for companies that ship jobs overseas."